I am a dedicated sportsman, hunter, and outdoors enthusiast. For over forty years I have been manufacturing turkey calls, deer lures & scents, and fishing lures. I have judged, promoted, and participated in many Turkey Calling Contest, Deer and Turkey Seminars, Videos, TV, and Radio Shows over the past years. My knowledge of deer lures & scents, fish lures, and turkey call making have been developed through many years of trial and error. I feel I have now perfected and made available some of the finest products on the market today. Products sold under the Paul Meek Outdoors Label have been tested and proven on the stage and in the field many times over. I enjoy writing stories and poetry about hunting and my experiences in the outdoors, and have had several works published. I am on the Editorial Board of Mississippi Woods & Water Magazine and the Advisory Staff of American Heritage Video. 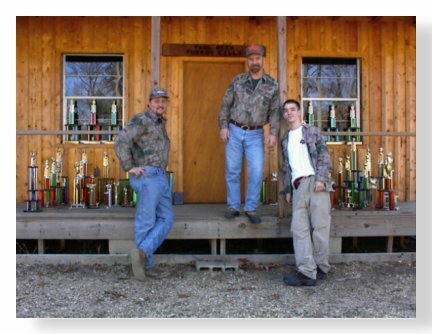 My two sons, Shawn and P.W., have participated in and won many Turkey Calling Contest throughout the south and both are Mississippi Champion Turkey Callers. My daughter, Tmara, now assists me with making the calls and is in the National Guard. My products are ALL hand made by my family. All products are made in limited quantities each year. I appreciate your interest in my products and would like to thank my family, friends and customers in making my products possible.